Pamper fatigued feet with the BeautyPro Foot Therapy Collagen Infused Bootie with Removable Toe Tip; an innovative, dual-function foot mask that hydrates and nourishes feet in need. 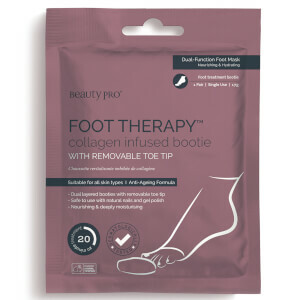 The single-use socks simply slide onto feet, instantly delivering an anti-ageing cocktail of ingredients. Enriched with a skin-loving dose of Marine Collagen, Shea Butter and Vitamin E, the masks envelop feet in a veil of rich moisture that thoroughly nourishes skin, whilst a cooling dose of Peppermint ensures they feel refreshed. Arriving with removable toe tips, the dual layered booties can be worn whilst painting nails, giving feet an entire pampering experience. 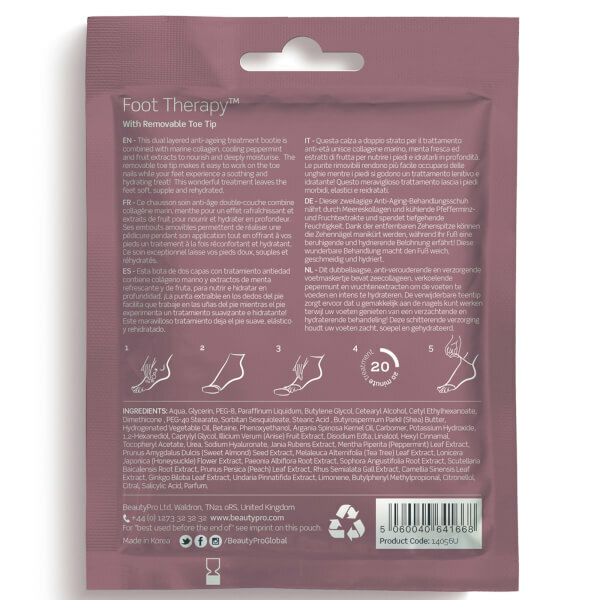 Within twenty minutes, the treatment socks can be removed to reveal soft, youthful and supple skin that is comfortably hydrated. Key Ingredients: Argan Oil, Rose Water, Shea Butter, Marine Collagen, Vitamin-E, Peppermint, Ginkgo Biloba, Salicylic Acid (BHA Complex), Sweet Almond, Chamomile, Honeysuckle, Peach, Anise, Apple, Lemon, Orange, Olive, Grape and Lime.